The transfer of knowledge by trainers on specialist technical training differs from typical presentations made for commercial purposes, or technical seminars. 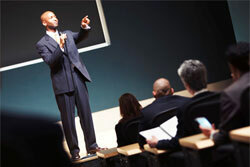 Specialist courses are usually run for several days by the same person and among a limited number of students. The trainer must ensure that the course is conducted at an appropriate level and that he provides the students with everything they expect from this course. And at this point the role of the trainer is becoming very serious. Some trainers are actually able to draw listeners’ attention and make them interested in the topic so much that the participants could sit for hours and absorb the knowledge conveyed in such a fascinating way. Others, wanting to convey some information, do it in such a way that despite great efforts they cannot make any positive impression on the listeners. Sometimes it is evidently the fault of the lecturer himself, and sometimes it is influenced by other factors, such as poor training organization, hardware failure, late hour or lack of good refreshments, which may turn out to be so. the proverbial "nail to the coffin". It is not so easy to become a coach, and it is certainly very difficult to become a good and respected trainer. You must earn it through your work, competence and experience. There are many specialists with rich practice and having the comfort that they can develop knowledge only as part of their work. Of course, it is very good if such a person goes beyond his / her field and gets to know the various additional secrets of the systems they support. And praise him because, especially on the IT market, you have to be prepared for various novelties and other "wonders" of technology. However, in most cases, such a professional has no time or inclination to be a trainer. Despite all his experience, he may not have adequate pedagogical skills or for some other reasons, he does not want to pass on to anyone his hard knowledge gained over years of experience. There are also others who can also boast of great experience, but want to share their knowledge and give them a lot of pleasure. Such people either already have the title of trainer, or they want to get it for some reason sooner or later. Of course, there is no coach without a proper training center, so whether a person is a trainer or not is sometimes a matter for the right decision makers.